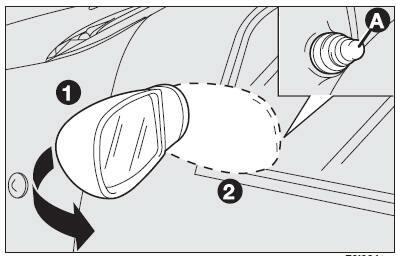 From the passenger compartment, use knob (A) to make the required adjustments. When required (for example when the mirror causes difficulty in narrow spaces) it is possible to fold the mirror moving it from position (1) to position (2). This operation can be only performed with ignition key to MAR. IMPORTANT Any adjustment of the mirror position must be carried out only with the car stationary and handbrake engaged. mirrors shall always be in position (1). mirror is curved, it may slightly alter the perception of distance.